We’ve all heard how important it is to brush our teeth at least twice per day, but it’s also very important to floss your teeth as well. Flossing may seem like a chore but it helps to remove the food debris and plaque build up from in between your teeth. Did you know that tooth decay can occur in between your teeth, and you can get cavities in between your teeth that your dentist will have to repair? Your Salinas, CA dentist has some tips for you on how to properly floss your teeth. Start with enough floss to wrap around your fingers a few times. Grasp the floss firmly and guide it in between you teeth forming a C shape that hugs the tooth as you reach the gum line. Use fresh sections of floss as you repeat the process with every tooth. Pay close attention to the molars in the back of your mouth, being careful not to miss a section, as this is where most tooth decay and gum disease starts. Children should begin flossing their teeth as soon as they have teeth next to each other. They will need guidance and your assistance flossing until around the age of eleven years old. You may want to invest in some plastic Y shaped flossers to help your child with those hard to reach places. Teaching your children the proper techniques for flossing when they’re young helps them to form good oral hygiene habits that will last a lifetime. Even though you may not be feeling your best, it’s even more important to keep up with your flossing routine during pregnancy. Because of the many hormone changes experienced during pregnancy, you are at a higher risk for gum disease and enamel wear. Your gums may also be red, swollen, and tender during pregnancy. You may want to see your dentist for additional cleanings to support your oral health during this time. Many dental issues such as tooth decay, cavities, and gum disease can be prevented with an excellent home care routine and regular visits to your dentist. Did you know that your oral health is also linked to your overall health? Maintaining optimum oral health can help you with other systemic issues such as cardiovascular disease, diabetes, and strokes. Flossing should be an integral part of your home care routine. 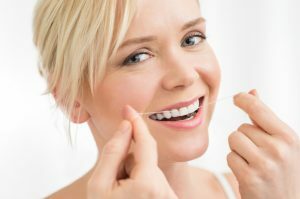 If you’re unsure of how to floss your teeth properly, ask your dental hygienist for tips on your technique. At Blanco Circle Dental Care, Dr. Gary Klugman and Dr. Christina Bianco want to be your partners in oral health. We welcome patients of all ages to our practice and we offer a wide range of services designed to meet all of your dental needs from cleaning your teeth, to enhancing your smile. Contact our office today to schedule your regular cleaning and check up.